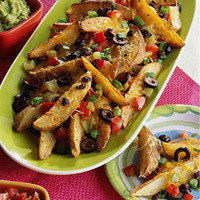 Baked potato wedges take the place of tortilla chips in this Mexican style appetizer. Place potatoes into a medium bowl with the oil, garlic salt, and Mexican seasoning. Stir well to coat potatoes. Top with cheese, beans, tomatoes, olives, onions, and chilies. Bake for 5 minutes longer to melt the cheese. Serve with salsa, guacamole, and sour cream, if desired.